What is the REAP apprenticeship experience? REAP apprentices are high-school age students selected for their interest in science, technology, engineering and mathematics (STEM). Special consideration is given to under-represented groups. 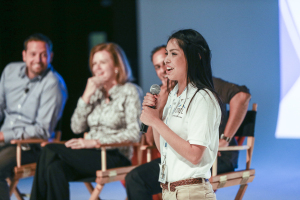 Motivate students toward a career in science, mathematics, or technology. Expand students’ background and understanding of scientific research. Engage students’ active participation into the philosophy and objectives of scientific research. Expose students to science experiences not readily available in high school. Introduce students to the real world of research in these fields. Partner students with faculty mentors to support current and future professional growth and development. What do participants gain from a REAP apprenticeship? REAP apprentices typically spend a summer in a university research program under the tutelage of a professional mentor, performing experiments and carrying out research activities that immerse them in the realities and opportunities of careers in the applied sciences, engineering and mathematics, changing attitudes and firing the imagination of student participants—many who have but a general idea of what a career in these areas entails, and little or no contact with adults doing this work. Through the REAP experience, student participants are exposed to the real world of these careers and are able to see themselves as scientists and researchers. In a typical setting, students spend time applying their knowledge, performing experiments, participating in field trips or working in groups. REAP provides a much needed dimension to their education by allowing them opportunities to work shoulder to shoulder with researchers in university laboratories participating in original research, exploring interests and making informed educational and career decisions. For general informaton, please contact Laura Masterton at lmasterton@fbinaa.org. The 2018 YLP Program is scheduled for June 21 – 29, 2018. Applications available from the Chapter’s YLP Coordinator. Deadline for Applications submitted to the Chapter’s YLP Coordinator. All Candidate Nominations Packages from Chapters/Associations are due to the FBINAA Executive Office. No candidate nominations will be accepted after this date. Final vetting/selection of YLP students will be made by the Executive Office and Chapters/Associations will be notified of their candidates acceptance. Acceptance letters, File of Life and other pertinent information will be sent to candidates. Program commences; Students arrive and are picked up at Reagan National Airport. Program ends; Students Graduate and return home. The internship program provides comprehensive preparation for the pursuit of undergraduate science majors. Student Scholars usually finish the program excited about neuroscience, with an interest in exploring neuroscience-related academic and professional careers. Student Scholars are hired and paid taxable hourly wages (through their matched institution) for their full-time commitment of 40 hr/wk during the eight-week program. Preference for high school students currently enrolled in their junior or senior year (must be 16 years old by June 4th). Grade point average of at least a 3.0 or the equivalent (B average). Advanced Placement (or other college level) science courses recommended. Able to commit full-time (40 hr/wk) to the entire 8-week program (cannot hold other employment or attend other camps during ION). Scholars must arrange in advance local Atlanta housing and transportation, and are responsible for their meals throughout the summer program. Applications will be reviewed, a subset of applicants will be invited to interview at Georgia State University in mid-March, and final decisions regarding acceptance will be made and applicants notified in early April. Immunization records, current TB test results, drug test results, and tax documents will be required for all ACCEPTED Scholars. All-paid travel expenses to the Annual STEP-UP Research Symposium held on NIH’s main campus in Bethesda, Maryland. 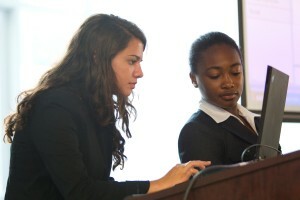 Students are given the opportunity to conduct a formal oral and poster presentation. WHAT ARE THE BENEFITS OF HDCDP? Study at Harvard– Students accepted into this program are simultaneously accepted into Harvard Debate Council’s summer residential program at Harvard College. This exclusive educational experience provides unmatched future advantages to our students. The HDCDP board is raising scholarship funds in an effort to cover each student’s tuition, room & board, and travel. Enhance college application & professional resume – Academic achievement is not enough for top-tiered colleges & universities; they desire students with leadership acumen. HDCDP students gain exclusive leadership experiences that will enhance their college application and build their professional resume. 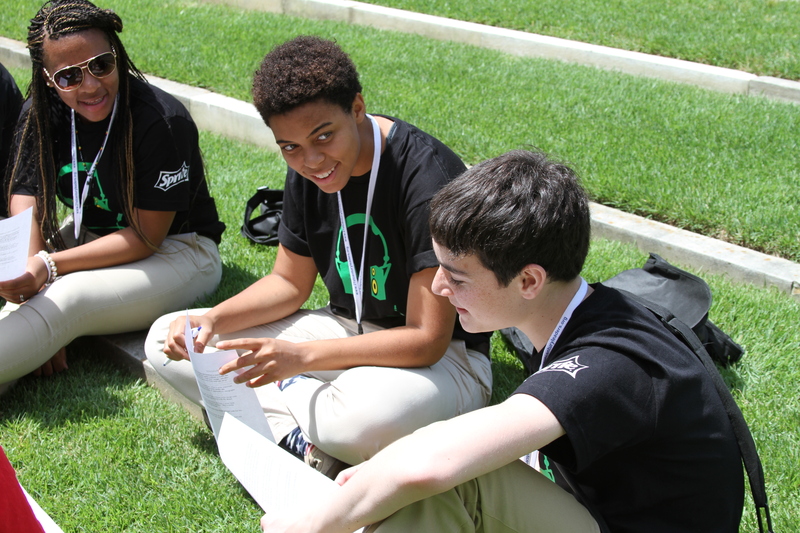 Pre-collegiate training – In Atlanta, students will acquire advanced enrichment through a rigorous academic program in which they will explore content higher than what is available in a traditional high school setting. From January thru June, students will undergo intensive training by Harvard instructors in preparation to study at Harvard College in July. 1.) Scholarship: An incubator for academic excellence– Our goal is to train citizens and leaders of the world, which requires global consciousness. Students will explore international issues through a rigorous curriculum centered on critical thinking, research, analysis, and academic debate. 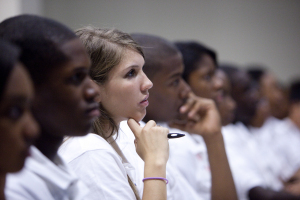 Students are taught by Harvard instructors, during which they identify, cultivate, and use their voice in matters of social and political justice. 2.) Leadership: A launchpad for young leaders – The fact that young people do not have a vote in elections does not mean they shouldn’t have a voice. 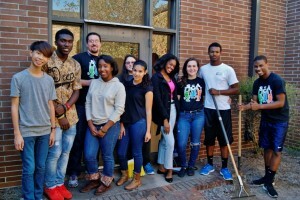 This program provides exposure to the challenges that confront today’s voting public through unique non-partisan experiences engaging in local politics and community activism in the city of Atlanta. 3.) Culture: A hub for cultural pride – We seek to cultivate cultural ambassadors that reform the meaning of scholarship into one that is appealing and accessible to black youth. We endeavor to foster a sense of cultural pride through the exploration of African-American history, leadership, and erudition. Our charge is to develop students that will embody the principle, “Lift as you climb” – ascending the ranks of social status while reaching back to pull others up, too. Work on a STEM project at one of over 150 participating Georgia companies! The internships are paid, and the experience is priceless. 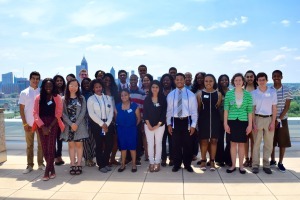 The TAG-Ed Summer Internship Program was created to give students like you real world STEM experience at companies around Atlanta and the state of Georgia. For five weeks or more, you will work with a mentor on a specific project, not only honing your technical skills, but also developing the professional skills you will need to excel through high school and beyond. Applications to become a TAG-Ed Summer Intern are now open! We highly recommend you preview the application before starting by clicking “PREVIEW APP” below. The deadline to apply is June 12. Join more than 800 participants who have grown through their summer experience with TAG-Ed. Intern at Rural Sourcing, Inc.
TAG-Ed is partnering with Concept Software, Inc. to bring an alternate opportunity for TAG-Ed intern applicants this summer: STEAM summer bootcamps. 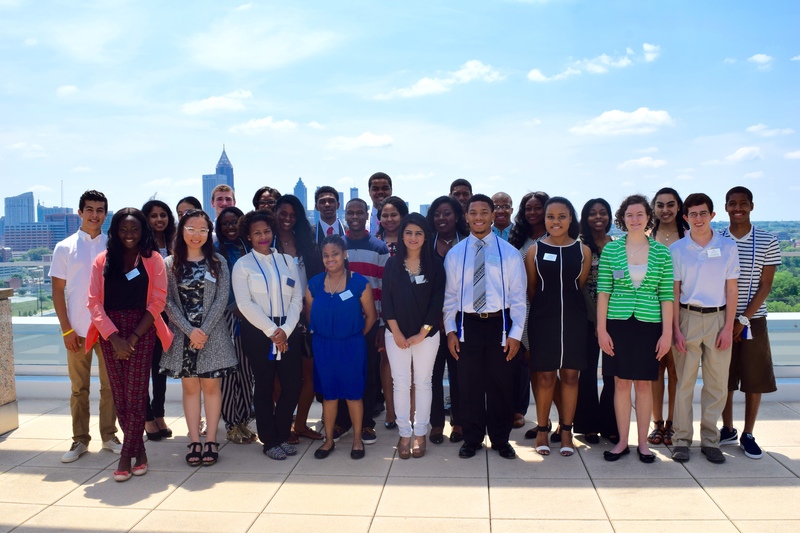 These intensive, four-week programs will be made available to top-tier students who are not matched with companies for TAG-Ed summer internships. This presents an excellent opportunity for students to continue building their technology (Course 1: Introduction to Technology) or marketing skills (Course 2: Digital Media Marketing & SEO) to prepare them for future professional experiences – at absolutely no cost! When applying for your TAG-Ed internship, simply indicate whether you would also like to be considered for the 2017 STEAMConcept Bootcamp. Concept Software will then contact you directly with a secondary application. Note: this will not affect the chances of you receiving a TAG-Ed summer internship. All students will first be considered for a TAG-Ed internship. Become the leader you were always meant to be. Become a 21st Century Leader! Imagine spending the next three years of high school with access to exclusive summer leadership institutes, hands-on experiences and training, a community of like-minded and motivated peers, and a network of leading Georgia business and professional leaders working with you. 21st Century Leaders offers you all of that and so much more. Become a 21st Century Leader and be inspired to lead. Experience an intensive week-long residential leadership program as your first exposure to 21st Century Leaders. 21CL offers three exclusive summer leadership institutes, expanding your leadership skills and exposing you to various businesses and industries throughout the state of Georgia. Each leadership institute will engage you through interactive workshops, corporate tours, round-tables with business leaders, and team-building exercises. Plus, you’ll have the time of your life while living on a college-campus, expanding your skills and meeting a diverse group of students from all across the state! Leadership Connect is the perfect way to start your 21st Century Leaders journey! Leadership Connect is our online learning platform, challenging and connecting you to a new set of online workshops, hands-on activities, and exclusive opportunities expanding your leadership skills and career interests for the future! Earn incentives, rewards, special experiences, digital badges, and maybe even a spot in the interview round of our summer leadership institutes! As a 21st Century Leader, you have access to a full range of training opportunities throughout the year. From two-day summits to online workshops, you can pick and choose the training that works best for you to further your skills and inspire you to lead. Take a look at what we have to offer! 21CL provides three dynamic special youth leadership teams for our students, which are comprised of highly engaged and motivated 21CL students who work together and independently on fulfilling the mission of 21st Century Leaders. Youth Leadership Centers bring the 21CL experience to your school through student–led leadership and community service-based club centered in participating Georgia high schools.